The Christian Science Monitor published an article about the sale of the Pontiac Silverdome. 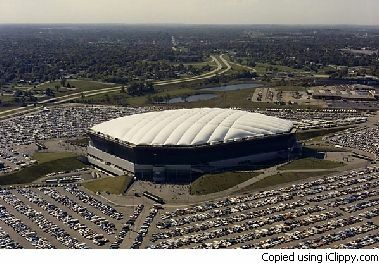 The silver dome was the former home of the Detroit Lions which cost 55.7 million to build in 1975. Just recently the 80,300 seat indoor stadium sold for for $583,000 nearly 1 percent of what the original cost of building it was. We do have at least one good sports team and we don’t have any of our famous sports arenas selling for 1 percent of what it cost to build them. In fact we still have houses that sell for $583,000. Well with a little comparison you can always be thankful… We can be thankful that we have more jobs than Detroit. Detroiters can be thankful that they don’t live in a third world refuge shanty town. We can all be thankful that we live in a mostly free country that at this point still offers plenty of opportunity for the hard and creative worker. I think I am misquoting Napolean Hill here but he said that with in every problem or trial are the seeds of an equal or greater success. I don’t know that that is true universally… however I believe it is true to a greater extent than any of us can imagine. Today is Thanksgiving. There are a lot of people facing difficult times. If you are one of them one of the best things you can do in any moment is to give thanks to your creator for what you have been given. This is especially true in hard times. When we are especially down we can find joy as we reach out to others and focus on others to assist them with their problems. This counter acts continual self focus of depression and paign gives us a new perspective… this is addition to the special reward of satisfaction we recieve as we reach out to people in need. May you have a Happy Thanksgiving!